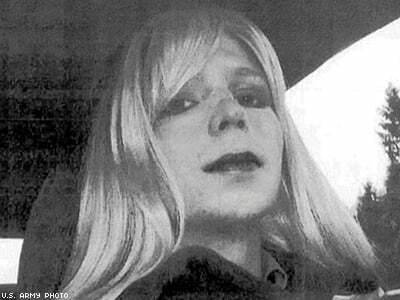 The former army intelligence officer who released thousands of classified government documents to WikiLeaks in 2010 reportedly struggled with gender identity issues. Bradley Manning, the former Army intelligence officer currently facing more than 90 years in prison for releasing thousands of classified documents detailing government and military corruption to the website Wikileaks in 2010, struggled with gender identity issues while serving in Iraq, said an Army psychologist who treated Manning at a sentencing hearing Wednesday. Manning, a private first class who served under the military's repressive "don't ask, don't tell" policy, eventually came out as transgender to Capt. Michael Worsley, the Army psychologist said Wednesday, according to the Associated Press. Even after DADT was repealed in 2011, transgender people are still not allowed to serve openly in the U.S. Armed Forces, since military code considers gender dysphoria or any gender-affirming medical procedures indicative of a "mental illness." Manning, who has alternately been described as gay and transgender, reportedly told Worsley that she hoped joining the Army would rid the young private, assigned male at birth, of her desires to become female. Illustrating her internal struggle, Manning sent the above photo to Worsley, along with a letter titled "My Problem," where she detailed her struggles with her gender identity and hopes that enlisting "would get rid of it." At Manning's sentencing hearing Wednesday, Worsley testified that the soldier had almost no support network to take care of her mental health while serving as an intelligence analyst in Iraq. "You put him in that kind of hypermasculine environment, if you will, with little support and few coping skills, the pressure would have been difficult to say the least," Worsley said, according to AP. "It would have been incredible." In 2010 as an Army intelligence officer, Manning released some 700,000 government documents and diplomatic cables that exposed widespread military and diplomatic injustices to the website WikiLeaks. Among the revelations Manning exposed was a video showing a U.S. helicopter crew laughing as they carried out an air strike that killed a dozen people — including a photographer and driver working for Reuters news agency — in Baghdad in 2007, according to London's Guardian. While Manning was acquitted last month of the most serious charge against her — aiding the enemy — she was found guilty of nearly 30 other counts, including espionage and violating military code, and could face up to 125 years in prison. Manning's attorneys testified in court Wednesday that the former private's commanders should have recognized the signs of mental instability earlier and not sent Manning to Iraq or given her access to classified information in the first place. Because of this, the defense argued, the judge should be lenient in sentencing Manning.